- Study of the Environmental Impact Assessment (EIA) of Taj Exotica Resort & Spa, Phuket Province Taj Asia (Thailand) Co., Ltd.
- Study of the Environmental Impact Assessment (EIA) of Taj Power Plant, Phuket Province Taj Asia (Thailand) Co., Ltd.
- Study of the Environmental Impact Assessment (EIA) of Pakasai Resort, Krabi Province Thong Sun Co., Ltd.
- Study of the Environmental Impact Assessment (EIA) of The Complete Naratiwas, Bangkok Province Prinsiri PCL. - Study of the Environmental Impact Assessment (EIA) of Amthada Park Plaza Sathorn, Bangkok Province Resident No.9 Co., Ltd.
- Study of the Environmental Initial Assessment (IEE) of Leelawadee Resort, Prachuapkhirikhan Province Leelawadee Co., Ltd.
- A Preliminary Study on Impact of the Environmental Laws on Capital Cost of Industrial Development Reckit Benckiser Co., Ltd.
- Study of Environmental Initial Assessment of Eight Heaven Resort and Spa, Pangnga Province The Eight Heaven Co., Ltd.
- Study of Environmental Impact Assessment of See Bay By Haibin, Samut Prakan Province Haibin Construction Co., Ltd.
- Study of Environmental Impact Assessment of Cool Breeze, Chonburi Provinces Seaside Consulting Co., Ltd.
- Study of Environmental Initial Assessment of Cape Nidthra Hua Hin, Prachuapkhirikhan Province Kasemkit Co., Ltd.
-	Feasibility study of Producing the Mix of Waste Blending Project, The Administration Center in Industrial Waste in Bangpu, Samutprakarn Provinces Better World Green Co., Ltd.
- Study of Environmental Impact Assessment of Chlo Akaline Fatory, Map Ta Phut Industrial Estate, Rayoung Province Thai Asahi Chemicals Co., Ltd.
- Study of Environmental Initial Assessment of Cha-am Condominium Long Beach Cha-am Resort Co., Ltd.
- Study of Environmental Impact Assessment of Royal Wing Resort, Phuket Province Phuket Ocean Resort Co., Ltd.
- Study of Environmental Impact Assessment of Kamala Beach Hotel and Resort, Phuket Province Phuket Ocean Resort Co., Ltd.
- Study of Environmental Impact Assessment of Ao Nang Cliff Beach Hotel, Krabi Province Ao Nang Cliff Beach Co., Ltd.
- Study of the Environmental Impact Assessment (EIA) of Bangphra Golf Resort Hotel, Chonburi Bangphra Golf International Co., Ltd.
- Study of the Environmental Impact Assessment (EIA) of Kanary Bay Hotel, Rayong Kasemkit Co., Ltd.
-Study of the Environmental Impact Assessment (EIA) of Kabinburi Hotel, Prachinburi B.L.H. Treading Co., Ltd.
- Study of the Initial Environmental Examination (IEE) of Cha-am Villa Beach Hotel Cha-am Villa Beach Hotel Co.,Ltd. 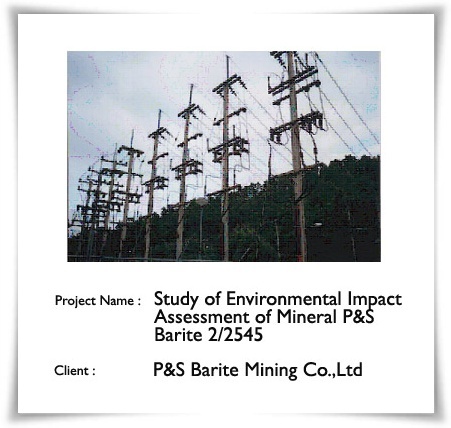 - Study of Environmental Impact Assessment of Mineral P&S Barite 2/2545(19825/14824) P&S Barite Mining Co.,Ltd. 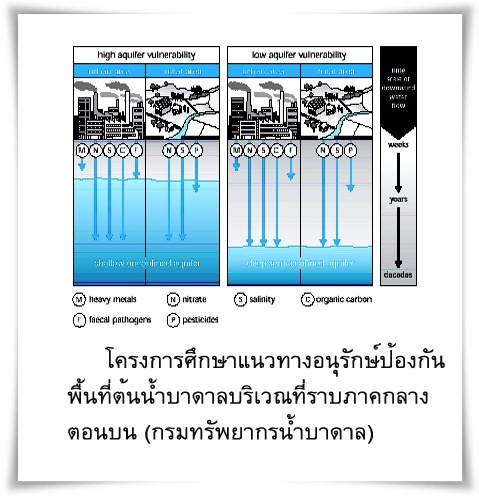 - Study of the Environmental Impact Assessment of Bangthoun Beach Resort Lagoon beach resort Co.,Ltd. 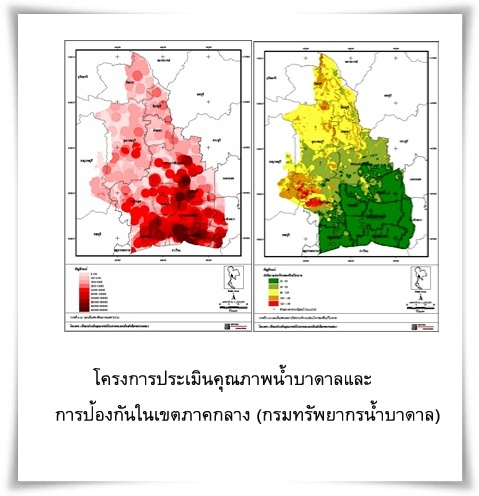 - Monitoring the Environmental Quality of Preuksa 10 Village Preuksa Real Estate Co.,Ltd. - Monitoring the Environmental Quality of Preuksa 13 Village Preuksa Real Estate Co.,Ltd. - Study of Quality of Groundwater and Protection at Central Plan Groundwater Division, Department of Mineral Resources, Ministry of Industry. 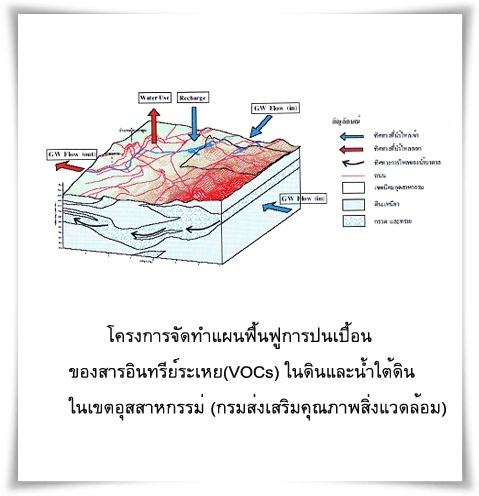 - Study of the Initial Environmental Evaluation of Patong Cottage Project Patong Cottage View Co.,Ltd. - Study of Environmental Impact Assessment For new CC-GRD Manufacturing Factory Eastern Hobas Pipes Co.,Ltd. CDW Co.,Ltd. 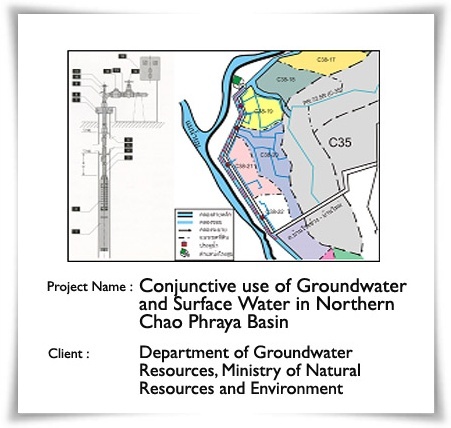 - Study of Water Demand in the Urban Areas of Phuket Province Anglian Water (Thailand) Ltd.
- Groundwater Modeling for Validation of a Dewatering System Design Layne (Thailand) Co., Ltd.